What is Digital mucous cyst? Digital mucous cyst is a condition where it, as in the ganglion cyst will arise at the end of the finger knuckle, that is, the distal interphalangeal joint. It may also arise from the nail matrix and appear on the fingertip’s back. The term digital mucous cyst has a Greek origin. Digitus in Greek means finger, Mucous means a substance which is thick and cyst means an enclosed pouch. Commonly, there are quite a few other names for the very same condition as Digital Mucous Cyst. Some of them include nail cyst, digital mucoid cyst, myxoid cyst, cystic nodule, mucinous cyst, periungual ganglion and periarticular fibroma. Mucous cysts are more commonly found in women than in men. Furthermore, for people from the age group of 40 years to 70 years, especially with the ones who have the condition of osteoarthritis, mucous cyst can be observed. Even though people from any age group can be affected by it, this condition is rarely observed in children. In a lot of causes, the condition may occur due to some sort of trauma. However, it is important to note that these digital mucous cysts do not occur because of heredity. Any kind of infection cannot cause these cysts and they do not even spread. The digital mucous cysts are benign, which means that they do not tend to affect the tissues nearby their occurrence. Moreover, the cysts will never develop into or cause skin cancer. Some of these cysts have a possibility of arising from the knuckle of the distal finger. The reason why this happens is that the tissues of that joint might be degenerated and the other tissues which are not related with that joint develop because of the connective cells of tissue’s abnormal growth. Such cysts are ideally filled with thick, clear, jelly resembling substance. 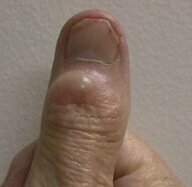 Formation of a cyst or many cysts on the tip of the finger. Over a period of many months, a 1 mm to 10 mm small or bigger in the rarest of cases, a lump, much like a rubbery papule appears on the finger tip’s upper side. It can occur on any of the fingers, but in most cases, it happens on the middle finger or the index finger of the hand predominantly. In rare cases, such cysts can also develop on the toes. These cysts are generally bluish or partially translucent. Some of them may even resemble warts. Because of this, it leads to a thinning of the overlying skin and it even becomes translucent partially. In other cases, it can become thick moderately; can become flesh colored, and rough like a wart. In many cases, such cysts can appear beneath the finger nail which would look depressed. It may even possess longitudinal grooves or blue and/or red lunula. Lunula is the normally pale, thin, part of the finger nail. Such nail grooves can precede the cyst formation for as long as six months. These cysts are tender to the touch. Generally, the cysts which are bigger in size are much more painful. Understandably, this leads to a decrease in the motion of the unaffected finger joints. Such cysts can burst spontaneously or may even disappear. Through observing the cyst’s palpation, a doctor can easily make the diagnosis. A translucent cyst can be revealed from Transillumination. Injecting the dye methylene blue in the cyst before 12 hours of the surgery can help the revelation of the origin and extent of the cyst at the time of the surgery being done. MRI, CT or Ultrasound can detect the cyst clearly. Carrying out an X-ray may reveal some bone spurs or osteophytes in the distal part of the interphalangeal joint. These are usually linked to osteoarthritis. This Digital Mucous can look like a lot of things. It can look like bone spurs, molluscim contagiosum, warts, herpetic whitlow and even xanthomas. 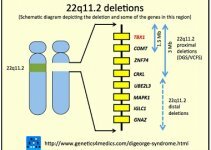 Xanthomas are the yellowish bumps occurring in people who have an increased level of triglyceride. Compressing them or massaging them with the help of the fingers. Laser vaporization by using Carbon dioxide. Carrying out chemical cauterization using phenol. Using some ointments like silver nitrate, heparin cream or triamcinolone acetonide. The complication which can occur for the last one is that it can cause local depigmentation or thinning of the skin. Repeatedly puncturing with a needle followed by draining the contents is known to be effective for as many as 70% cases. Soaking the affected area in warmed water or application of some warm compresses can help. Curettage with electrodesiccation or without it. An aspiration using a large bore needled after injecting steroids is not known to be an effective method as it has a very high rate of recurrence of the cyst. Likewise, surgical excision using cold steele with a possible reconstruction of the graft also has a high recurrence rate. However, a cryosurgery using cryoprobes or carbon dioxide snow by the freeze thaw freeze method is known to be effective since it has about only 15% chances of the recurrence of the cyst. Likewise, Sclerotherapy with injecting Sodium tetradecyl sulfate or poliodocanol is also known to be an effective treatment method as it as a low rate of recurrence. Though there is a complication here – the sclerosant is possible to leak into joint. The bone spur or the osteophyte can also be removed surgically with the removal of the cyst or without removing the cyst. Either way, there is a risk to some complications – pain, deviation of the tip of the finger, impaired mobility, persistent swelling, tendon damage, joint or skin infection and even nail deformities. However, it is believed by many doctors that a finger splint can worn for anywhere between 2 days to 10 days post surgery to reduce the discomfort. It is very important to note here that the mucous cyst must not be struck using a book as it can lead to some serious finger injury. The above mentioned treatment methods have some complications. They can cause a limited movement or stiffness in distal interphalangeal joint. Moreover, the cyst treatment which is below the nail can also lead to a nail deformity which could be permanent. The recurrence of such mucous cysts is a common phenomenon and it can happen within 1 month to 3 months post treatment. One should know that removing the bone spurs and cysts surgically have the lowest rate of recurrence.